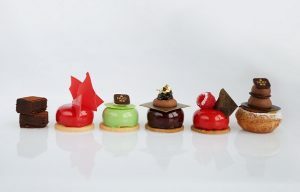 In collaboration with Laurent Moreno, one of the world’s most celebrated Pastry Chefs with experience at three star Michelin restaurants in France, NUO is launching a signature Chocolate Afternoon Tea from April 2, 2018. A heaven for chocoholics, Laurent Moreno will use his own personal recipes and lifelong skills to take your taste buds on a chocolate journey of a lifetime and to savour the springtacular French elegance. Chef Laurent discovered YUAN’s teas during his last trip in Beijing. Their subtle flavours as well as their fantastic complexity offering the ideal ground for creativity. A beautiful Parisian woman walking down Place Vendome on a rainy night of May in Louboutin shoes. A childhood memory. Chef’s Laurent very first pastry creation was a traditional French Cream Puff when we was 7 years old. Here comes his 2.0 Version. In Limoux, the village where Laurent comes from, people celebrate the longest carnival in the world every winter – 3 months – dressed in traditional cloth and holding the Limoux Stick. A piece of jewellery where you can taste, stunning to look at and out of the world in taste. A creation of caviar and dark chocolate with gold leaf foil floating above, Chef Laurent has re-invented the French dessert with a new twist (just for NUO). Chef Laurent rediscovered chocolates on the first trip to Vietnam last year. An intense road trip on the cacao road from pod to bar. 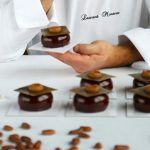 The master of modern dessert art Laurent Moreno, has over 15 years of professional experience and has worked with Pierre Hermé for a long time is a world-acclaimed Executive Pastry Chef and international dessert consultant. He represents Cabosse Chocolate and Grand Marnier brands as a Celebrity Ambassador.